Jasmin: I was fast asleep in Japan Airlines Business Class when I felt a hand frantically shaking my shoulder. I felt so bad for her – poor kid was embarrassed more than anything. After getting her cleaned up and tucked back in to her seat, I wondered if she’d maybe eaten something that disagreed with her. She didn’t seem to have a fever and settled down pretty quickly. But an hour later, she was up again, in tears, holding a barf bag in the aisle. “Probably a tummy bug,” I thought. I couldn’t have imagined a few days later we’d end up in the emergency room. After our flight from Tokyo, we had a ~12-hour stop in Vancouver before our next flight on Cathay Pacific to New York (JFK). My dad had come over on the ferry from Victoria to spend the day with us. 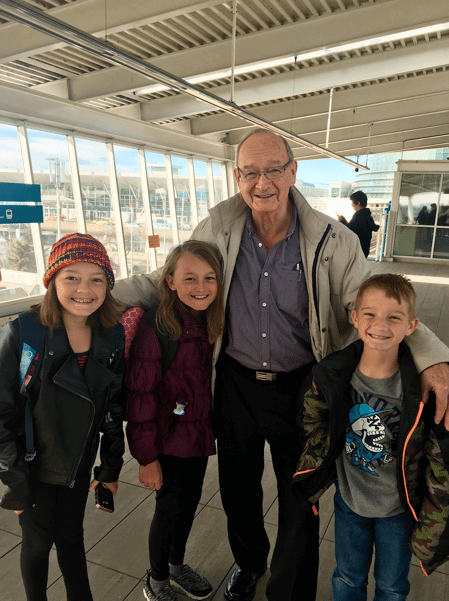 The kids were thrilled to hang out with Grandpa. But I could tell my daughter wasn’t herself. Her nausea and vomiting had abated, but she was super tired and wouldn’t eat dinner. And on the plane, her meal went untouched. I could tell she was disappointed that she couldn’t eat, because she’d been very much looking forward to the “fancy food” in Cathay Pacific Business Class. She slept a lot on the flight. And once we got home, she climbed into bed and didn’t get out for the rest of the day. That night, she developed a low-grade fever. I kept my daughter home from school the next day on account of the fever. Apart from that, and being incredibly tired, she had no other symptoms. And the fever went away. After returning to school for a couple of days, I got a call from the school nurse. “Come get her,” she said. 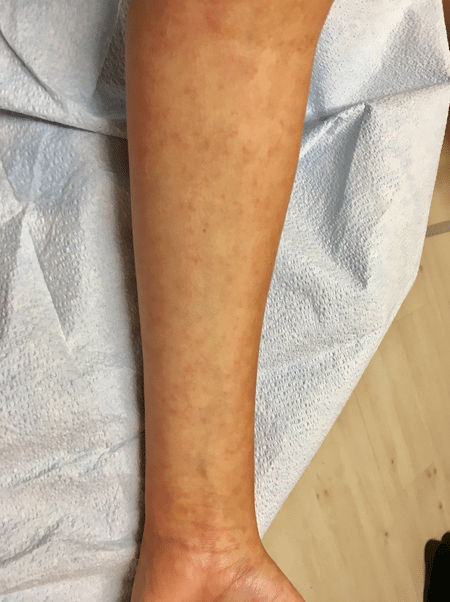 My daughter had developed a rash on her forearms, and the nurse suggested a trip to the doctor given our recent travel overseas. 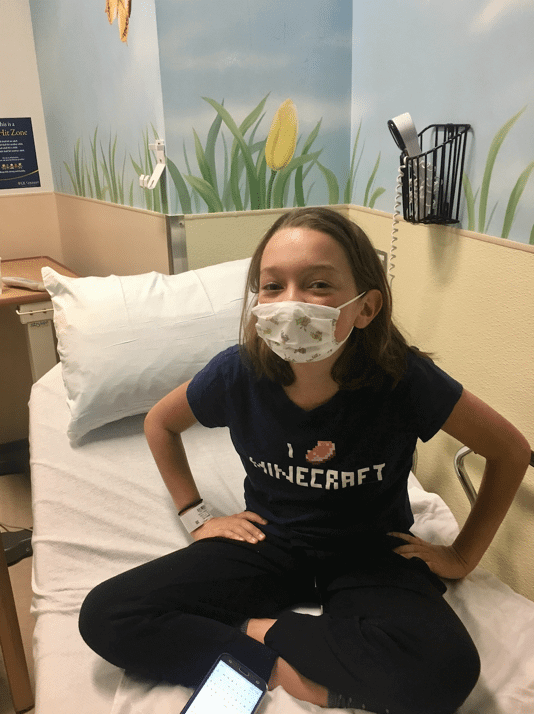 By the time we got to the doctor’s office, the rash had spread over most of my daughter’s body. Fine red dots covered her arms, legs, trunk, and face. My paranoid mom-brain started to panic…what if she’d picked up some dangerous virus in Asia? The doctor took her vitals, which were all normal. And rapid tests for strep and influenza came back negative. Still, the doctor was concerned on account of our trip. So she ordered a full blood work-up and testing for parasites and other nasty things we could have encountered along the way. And consulted with another doctor by phone for a second opinion. My mind raced back to the poster I’d seen at the school we visited in Pampanga, Philippines. I’d even taken a snapshot of it. Dengue was definitely a thing there. We’d been diligent about applying bug spray, but each of us did get a couple of mosquito bites despite being careful. Dark imaginings filled my head as I Googled “dengue symptoms.” I know, you’re not supposed to do that…but I’m a mom! The rash looked very similar, and blanched when pressed like a dengue rash does. And possible dengue complications included internal bleeding, organ damage, or even death. I tried to keep a calm demeanor so as not to alarm my daughter, but inside I was freaking out. We were sent home with instructions to stay hydrated and call if things got worse. The next morning, the rash had spread everywhere – even the soles of her feet and palms of her hands. She was also starting to itch, so I put in another call to the doctor. Fear and guilt welled up inside me. What if this was serious? Could I have done anything to prevent it? Maybe we shouldn’t have taken the trip. Will she have to be quarantined or admitted to the hospital? What about my other kids and her classmates? My mind raced in a hundred different directions as only a worried parent’s can. Fortunately, she was in good spirits despite the rash, itching, and promise of more blood draws. After hours of being seen by several doctors and having more blood taken to test specifically for dengue fever, malaria, and other tropical diseases, we were sent home. Late Saturday evening, the doctor called. I clenched in anticipation of very bad news – why else would they call on a Saturday night? Your daughter’s strep culture came back positive. She’ll need antibiotics – I’ll send in a prescription now. Strep? But she hadn’t had a sore throat at all! Come to find out, strep doesn’t just cause strep throat. The same bacteria causes scarlet fever! I breathed a sigh of relief – at least it wasn’t dengue. My daughter is on the mend now. But I keep kicking myself wondering if there was anything I could have done to prevent her contracting scarlet fever on our trip. 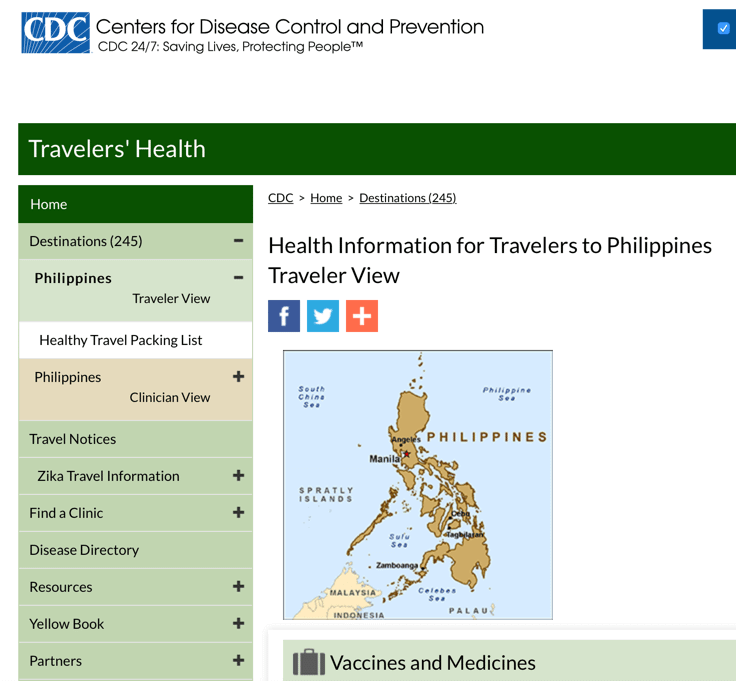 I’d checked the Centers for Disease Control and Prevention website for travel advisories before we left the US. And there hadn’t been anything alarming. 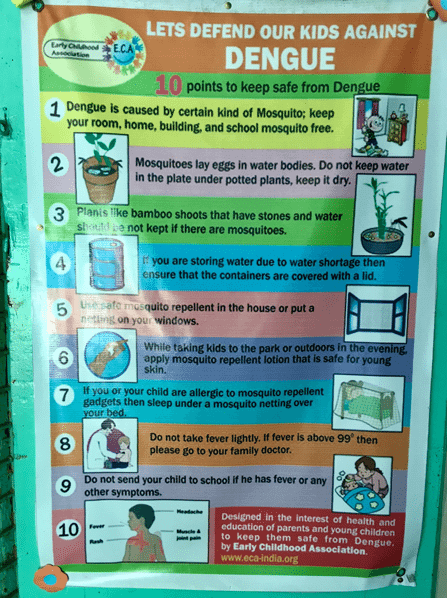 Even dengue isn’t mentioned for the Philippines, despite clear warnings being posted in one of the areas we traveled to. But a quick Google search reveals recent outbreaks of scarlet fever in spots like Hong Kong and the UK. And an airline friend let me know he’d just received a memo from their flight operations department with a “high threat alert” for scarlet fever on their South Korea layovers. I’m guessing my daughter picked it up at the airport or on a plane. There’s no vaccine for scarlet fever, because it’s caused by bacteria and not a virus. But in the future, I’ll be a LOT more mindful of the possibility of contracting a serious illness while we’re on the road. 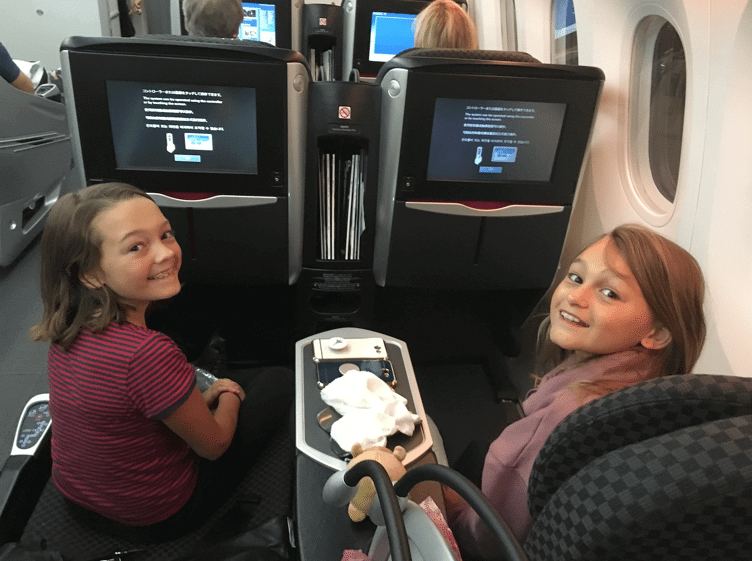 Travel Medical Insurance – I always purchase this when we travel outside the US, so we would have been protected had my daughter fallen ill before our return home. Sites like InsureMyTrip are a good starting point to compare plans and rates. Insect Repellant – I’m much more cognizant of the risk of mosquito-borne illness after this episode. Bug spray and mosquito nets are a must if you’re traveling to at-risk areas. I’ll now be a lot more diligent about applying it to the kids and myself. Hand Sanitizer – Good hygiene is always key to disease prevention. But kids don’t always lather up and do a thorough job of washing their hands. I’ll be much more liberal in the use of hand sanitizer and antibacterial soap going forward! Don’t Delay Seeing a Doctor – The biggest lesson I’ve learned from this is to NOT assume anything. Overseas travel exposes you many diseases that aren’t common back home. I wish I’d called the doctor as soon as we returned, even though my daughter’s symptoms seemed minor at the time. Google (but Not TOO Much) – Checking online for recent reports of disease or outbreaks in the area you’re traveling to can give you a feel for the risks. Unfortunately, it can also turn you into a fearful and paranoid mess! It’s probably best to just check with your doctor. And remember to book your trip with a credit card that offers travel protections like trip interruption, emergency evacuation, or accident insurance. It’s NOT a replacement for supplemental travel medical insurance, but it’s nice to have built-in coverage for other mishaps that might occur along the way. Sometimes overseas travel can hand you an unexpected souvenir. In my 12-year-old daughter’s case, it was in the form of scarlet fever she likely contracted on our return journey from the Philippines and Japan. I’m relieved her diagnosis wasn’t something more sinister. But for a while, the doctors were testing her for tropical diseases like dengue and malaria! It was a nerve-wracking experience to have to go to the emergency room, and I felt horrible thinking there was more I could have done to prevent this. Have you or your family ever gotten sick abroad? I’d love to hear your experiences in the comments. Took the family on a long awaited safari to Tanzania a couple of years ago. A few days after returning home our 14 year old daughter came down with a mysterious high fever. Her pediatrician wanted to watch it for a few days until I remembered that the clinic where we got our pre-travel immunizations had advised us to be alert to any fever that happened within a year of our trip. Fortunately, our doc made a couple of phone calls before sending us to our local children’s hospital where daughter was diagnosed with malaria which occurred in spite of the prophaxis drugs we had diligently taken. Treatment was effective and she was well within a week. Oh wow. Very glad to hear she is ok – that must have been scary! Great story, and thanks for all the information to keep in mind. I am glad that your daughter is ok.
Really interesting story. Glad your daughter is okay. Thanks for sharing.